Tsurukichi Hatano, when working as an elementary school teacher, came to know the situation of the local silk farming industry. This triggered his determination to do his part in improving the structure of the industry. 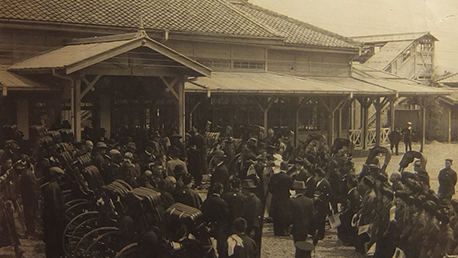 In 1886, Hatano became the head of the Ikaruga-gun Silk Industry Association. 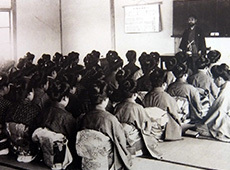 By assuming this position, Hatano began fulfilling his wish to contribute to the community to which he belongs by revitalizing the local silk industry. 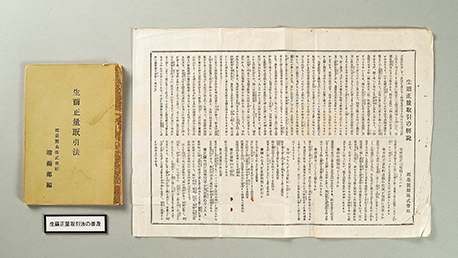 Faithful to the Bible, which says that “Every good tree bears good fruit, but a bad tree bears bad fruit,” Hatano believed that “Good people make good silk yarn, and trustworthy people make trustworthy products.” He also believed that love could inspire people to act. Based on these beliefs and his respect for people, he established an employee education program, and invited talented people to be factory managers and teachers. 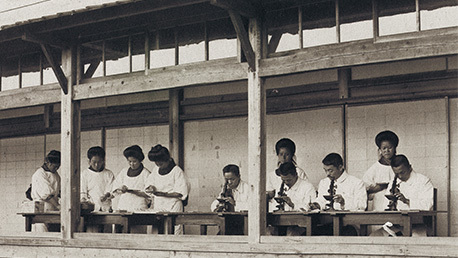 Employee education was provided equally, not only for female mill workers and other factory staff but for executives as well. Rather than simply being a part of the company’s business operations, the education program emphasized concern for employees and their happiness. Hatano was deeply impressed with these words from Masana Maeda, a government official who traveled around Japan campaigning, and thought that encouraging farmers to promote silk-raising was urgently needed for the development of Ikaruga-gun. 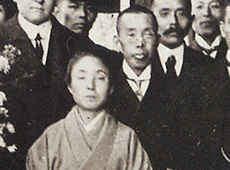 As such, he considered the development of the silk industry to be a policy of Ikaruga-gun and named his company Gunze Silk Manufacturing Co., Ltd. The president and his wife lived in a row house within the factory premises and they were always wearing work clothes. The president occasionally swept the garden and passages with a bamboo broom, with his wife following him and sprinkling water from a pail. Most of the company’s shareholders were underprivileged farmers, each holding a share or two. Every month, the president visited them to collect one or two yen as a monthly installment for their investment of 20 yen per share. First—absorb technical knowledge from the most advanced silk producing regions. 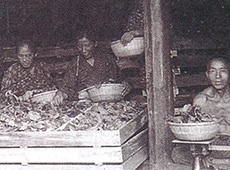 Hatano sent two young men to the Gunma and Fukushima prefectures to learn about techniques for raising silkworm and spinning silk yarn, and instructed them to obtain high-quality breeds. Second—develop talented human resources. Hatano opened a silk farming school and had graduates of the school visit silk farmers and give them guidance for raising silkworms. Third—set up a workshop to jointly sell raw silk yarn. Hatano collected raw silk yarn produced by small-scale producers at one place and classified them according to grade for joint sales. 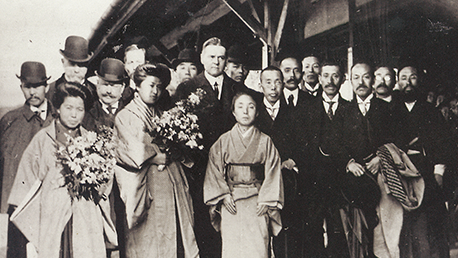 This was the beginning of high-quality silk manufacturing at Ikaruga-gun. By maintaining a steadfast commitment to quality, the high-quality silk produced by Gunze was highly acclaimed not only in Japan but also in the U.S. and the rest of the world. 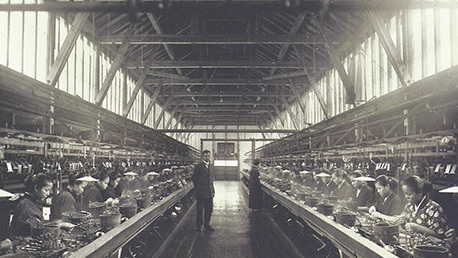 In 1901, Gunze’s commitment to producing the finest raw silk yarn caught the attention of the William Skinner and Sons Silk Manufacturing Company. When Skinner was checking the quality inspection record of raw silk yarn imported from Japan, he noticed one selection of yarn with an excellent record. Skinner then found out that the producer of this excellent-quality product was Gunze and agreed to purchase all the yarn the company could produce from the summer of 1902 onward. William Skinner and Sons was the world’s leading silk fabric manufacturer, and was fully committed to manufacturing trustworthy products. 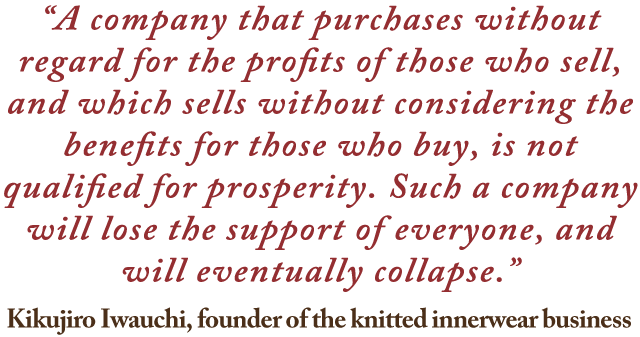 As a way to guarantee the quality of their products, they weaved the company name into the selvages of the woven fabrics. As such, the company’s requirements for the quality of raw silk yarn were extremely demanding, and they repeatedly urged Gunze to make further quality improvements. Gunze sincerely worked on these improvements to meet the expectations of William Skinner and Sons. The dealing of silkworm cocoons often involved bargaining between silk yarn manufacturers and silk farmers. Strong manufacturers held the upper hand in these negotiations, and tended to make their own decisions on prices and amounts of purchase. 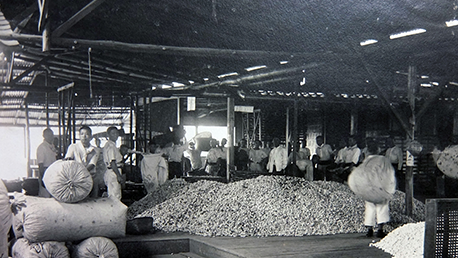 In 1909, Gunze established a transaction system called “Quality Evaluation Purchasing,” which advocated the purchase of silkworm cocoons based on joint scientific evaluation of quality, and determination of price to match that quality. This system effectively attached a price tag to silkworm cocoons and enabled fair and honest transactions based on mutual trust. As good silk farmers produce good silkworm cocoons, silk yarn manufacturers spin good yarn from good cocoons. Silk manufacturers purchase quality cocoons at high prices and quality silk yarn is purchased by fabric makers at high prices. Thus, high quality fabrics can be sold at high prices. This leads to co-prosperity among silk farmers, silk yarn manufacturers, and fabric producers. This was exactly what Hatano had wished for. Gunze also introduced the Market Price Contracts system, which established the market price on the 5th and 10th of each month regardless of fluctuations in the market price for raw silk. These innovative systems revolutionized silk transactions, and eventually spread throughout Japan. 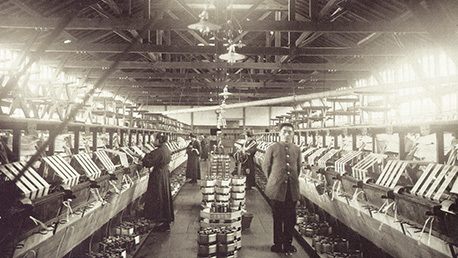 Soon after the end of World War II, Gunze launched the production of knitted innerwear in 1946 at the Miyazu Factory in Kyoto. 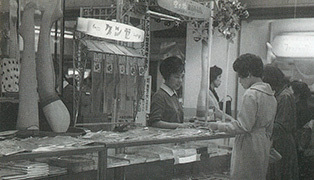 Inheriting Gunze’s founding principles, the factory’s business policy was “The best products attract the best customers, so we will produce absolutely fine quality products.” The Miyazu Factory remained committed to quality and, encouraged by the economic boom caused by special wartime procurements during the Korean War, its early stage knitted innerwear was highly regarded by leading department stores in Tokyo. The factory manager at that time, Kikujiro Iwauchi, set forth three basic policies—Quality First, Coexistence and Co-prosperity, and an Integrated Production System—in order to clearly specify the factory’s philosophy and operational structure. The postwar period saw continued shortages of commodities, which caused the market to be overrun with poor-quality products. Even so, Gunze carried through with its commitment to quality, with its products earning trust and favorable response from consumers. This was the starting point for the apparel business, and it remains one of Gunze’s mainstay business lines today. 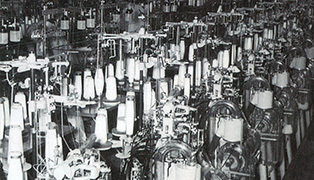 Gunze’s knitted innerwear business achieved fast growth in the second half of the 1950s. 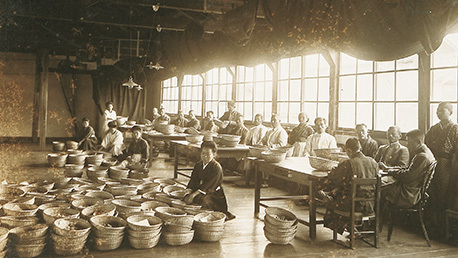 Based on this growth, the Yanase Factory also started production of knitted innerwear in 1959, followed by the Kuse Factory in 1961, resulting in six facilities dealing with innerwear production. In the 1960s and 1970s, Gunze built additional factories, steadily expanding its operations along with their affiliated factories. By 1968, the innerwear business had developed into the largest business for Gunze. In 1971, a joint-venture company Chonbang Gunze Co., Ltd. was established in South Korea. This was followed by the launch of a production facility in China through a technological assistance agreement with the government of China. These developments paved the way to globalization of operations. Gunze has always placed quality above profitability. In fact, quality is placed above everything else. As such, the company has consistently pursued the highest possible quality in its products. For knitting, Gunze always used high-quality yarn, and adopted technology to knit intact flawless fabrics in a high-density configuration. In the dyeing and bleaching processes, the purest whiteness was pursued without spoiling the cotton’s original texture. 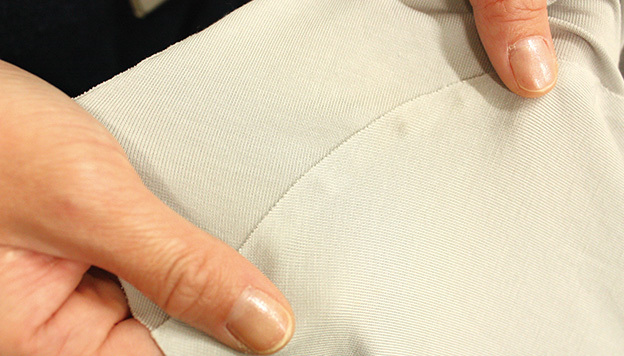 In sewing, Gunze focused on creating strong seams with beautifully aligned stitches. 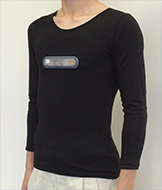 Conventionally, knitted innerwear was traded in terms of weight. But Gunze employed the “one price for one season” quotation price system (first in dozens, later in ten pieces). This was put in place in 1952, and was a “first” in the industry. The new pricing system meant that Gunze’s knitted innerwear was no longer subject to uncertain trading conditions, with price fluctuations caused by changing market prices of cotton yarn. In the following year, Gunze launched a three-season pre-order system for spring, summer, and autumn/winter. This enabled planned production, which contributed greatly to the enhancement of production efficiency. 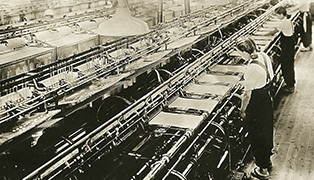 In the early 1930s, production of rayon expanded in the United States, which adversely impacted Japan’s export of silk yarn. Against this backdrop, Gunze launched production of women’s full-fashion stockings in order to boost demand for silk. This marked the company’s first foray into the apparel business. In 1952, Gunze succeeded in Japan’s first production of nylon full-fashion stockings, as a result of a three-year joint development with Toray Industries. The nylon stocking quickly spread among Japanese consumers as high-quality nylon became available on the market. In particular, Gunze’s development of run-resistant nylon tricot stockings with an attractive appearance resulted in sharp growth in demand. Around 1961, seamless stockings became an explosive hit. In 1968, the women’s hosiery industry saw the debut of pantyhose. Gunze released various hit products such as SHEER-PENNE. In 1990, the IFFI comfortable support pantyhose was launched to keep up with the increasing popularity of support stockings. As market competition intensified, Gunze concentrated on developing products that offer new value to consumers. 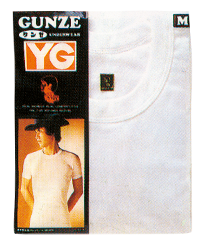 Beginning with the release of polo shirts in 1962, Gunze also made a foray into the nightwear field (such as pajamas). Later on, Gunze also launched a line of women’s outerwear under the LUFRAN brand. In 1965, Gunze started production of women’s innerwear, with its LOU and MONICA brands helping boost the reputation for Gunze’s foundation business. Also entering the baby innerwear field in 1974, Gunze’s apparel business has steadily expanded into diversified fields. 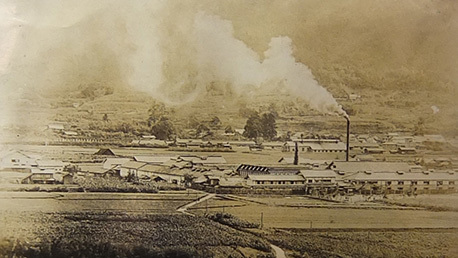 As silk yarn production, our startup business, was forced to contract, Gunze’s Tsuyama Factory started production of nylon industrial threads in 1954. To keep up with the growing demand for synthetic fibers to replace natural fibers, Gunze launched a new business of threads and accessories. Later on, Gunze entered the field of sewing threads by developing wooly nylon thread. 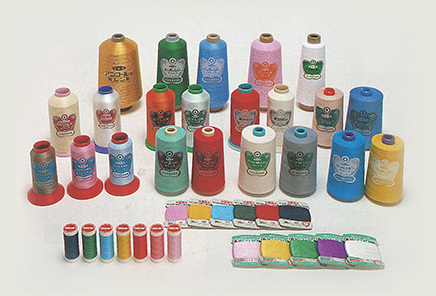 In 1972, the Tetoron spun thread made from polyester spun yarn, was released. Combining cotton yarn’s sewing ease with the strength of a synthetic fiber, this product was highly acclaimed in the marketplace, leading to a remarkable increase in our industrial thread sales. By contrast, the silk yarn business suffered a shortage of silkworm cocoons and a continuing drop in demand. In 1987, Gunze finally put an end to the business that had continued for 91 years since the company’s launch of silk manufacturing. 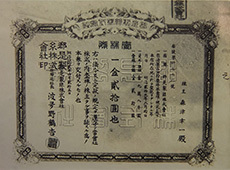 With a sharp increase in imported garments causing the demand for sewing thread in Japan to show a downward trend, Gunze established Gunzetal Ltd. in Hong Kong in 1972, and PT. Gunze Indonesia in 1994. This was part of Gunze’s strategy to shift its sewing thread production/sales bases outside Japan. Since then, Gunze’s sewing thread sales have steadily expanded, mainly in China as well as Southeast Asia including Indonesia. In Japan, Gunze’s sewing thread is highly evaluated for its quality, maintaining the company’s position as a leading sewing thread manufacturer in Japan. 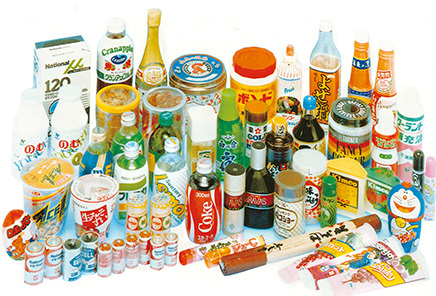 During Japan’s period of rapid growth in the 1950s to early 1960s, Gunze made a foray into the plastic film field, encouraged by the rapid growth of the petrochemical industry. As early as 1962, Gunze had already successfully developed polyvinyl chloride shrink film tubing, which enjoyed rapid growth in demand due to its outstanding packaging properties. Aiming at further expansion of the plastic film business, Gunze also launched commercial-scale production of biaxially-oriented polypropylene film. By leveraging the company’s proprietary shrinking technology acquired through the production of shrinkable tubes, we also began manufacturing flat sheet shrink films, steadily introducing high-performance products into the market one after another. As part of its drive to expand into new fields in the plastic film business, Gunze began processing fluorocarbon resins that are non-adhesive and resistant to heat and chemicals. This began in 1982 at the Moriyama Factory. In 1990, the new Konan Factory was established, mainly handling the production of roll covers and belts used in photocopiers and printers. This allowed Gunze to steadily expand its business, keeping up with the growing penetration of electronic office equipment into workplaces. In the field of electronic components, we focused our attention on the potential of transparent conductive film as a functional electronic material. 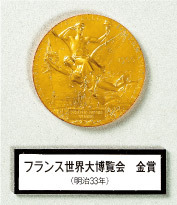 This led to the setup of a pilot plant in the Moriyama Factory in 1985, followed by full-scale production in the following year. This film can form a thin metal layer on a plastic film that functions as a circuit conductor to allow an electric current to pass through. With this property, the transparent conductive film is used for touch screens in notebook PCs, factory automation equipment, digital cameras, and many other products. 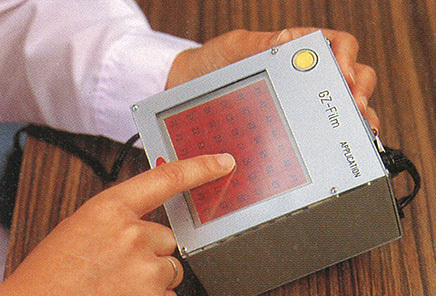 In 1984, our research laboratory participated in an R&D project for medical materials using bioabsorbable polymers. Gunze helped perform this research as a member of the project team led by Kyoto University’s Research Center for Medical Polymers and Biomaterials. 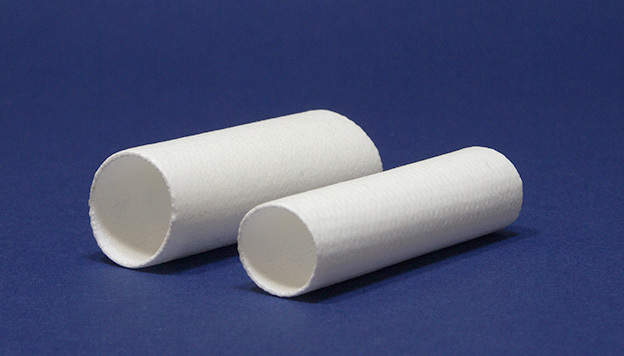 As part of this effort, Gunze became the first in Japan to succeed in the commercial-scale production of bioabsorbable suture threads for surgical use. 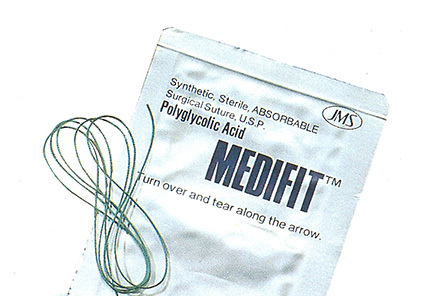 This suture degrades in the human body and is eventually absorbed completely after the wound heals. After receiving approval for production from the Ministry of Welfare, Gunze began marketing medical materials in 1986. This marked the start of our medical materials business. Since then, Gunze has produced various products that took advantage of the characteristics of bioabsorbable polymers, including bone fixation pins and artificial dermis to aid tissue regeneration for burns or wounds. Gunze has been focusing on the development of apparel products ideally suited for the “Cool Biz” and “Warm Biz” styles advocated by the Ministry of the Environment since 2005. To ensure wearer comfort at work at room temperatures of higher than 28ºC in summer and lower than 20ºC in winter, Gunze introduced innerwear featuring special functionality. For these products, functional materials were developed by drawing on Gunze proprietary technologies, such as COOLMAKE, which features high moisture absorption/release for a cool feel, and HOTMAGIC, a heat-generating material designed to turn body perspiration and moisture into heat. Since 2005, our trucks for cargo transportation use biodiesel fuel produced from frying oil collected from the Miyazu Factory. Gunze’s Plastic Film Company started mass-production of a hybrid nylon film that combines the characteristics of PET (polyethylene terephthalate) and nylon and marketed it under the brand of HEPTAX (HBN Type). This product supports both ecology requirements (reduction of negative environmental impact) and economy (cost reduction) by matching consumers’ budget-mindedness and preference of low-priced products. 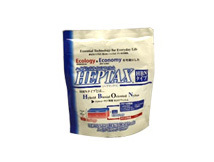 With its dual advantages of resource-saving and cost reduction, HEPTAX is widely used for food packaging and refill pouches. At Gunze the healthcare and medical field is positioned as the core driver for growth. As such, we have been committed to developing products designed to enhance quality of life (QOL). For example, our bioabsorbable medical materials, such as suture threads, have been used in clinical settings for many years. Our R&D efforts are now geared toward discovering new applications in the field of advanced medical care, paving the way for regenerative medicine. 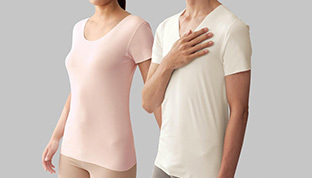 In the apparel field, we are expanding the stage of business from comfortable-to-wear clothing to include “medical care through wear.” This is being done by applying the outcomes of R&D into innerwear based on hominal physiology and related technologies. Soft innerwear suitable for postoperative patients and those with sensitive skin. 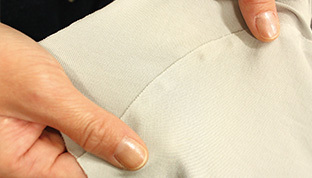 A special adhesive material used instead of stitches eliminates skin irritation caused by seams, reducing skin stress. In the apparel business centered around innerwear and legwear, Gunze possesses textile processing technologies such as knitting, weaving, and dyeing, as well as knowledge regarding comfort, safety and applicability for people, and comfortable sleep. In the functional solutions business represented by touch screens, conductive belts, and food packaging films, our technological base covers electronic circuit formation, materials development, and film surface processing. These solutions are supported through knowledge of transparent electrode formation and the creation of composite materials from multiple materials with different properties. By drawing on these technologies and knowhow and combining our apparel and functional solutions businesses, we are developing comfortable wearable devices that are carefully designed to suit human wearers.